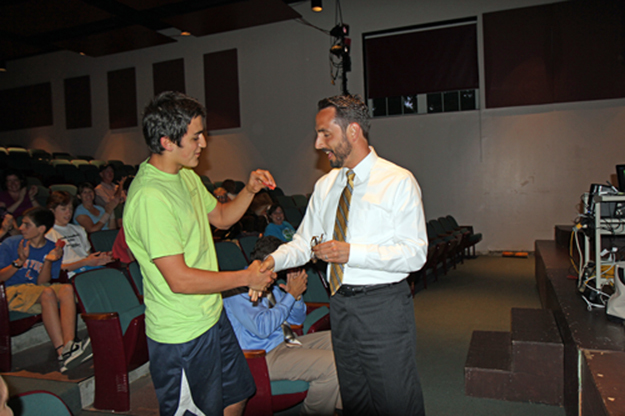 BEVERLEA WALZ PHOTO | School Superintendent Michael Hynes congratulating raffle winner Charlie Binder at the HUGS/CTC forum Tuesday night. Charlie and his date will go to the senior prom in a classic car. That was the message HUGS Executive Director Kym Laube carried to Shelter Island prom-bound students Tuesday night, imploring them to make smart decisions and abstain from alcohol in their teen years. HUGS, a leadership development and drug and alcohol prevention group, invited by Communities That Care of Shelter Island, hammered home a strong message to students about the dangers of underage drinking. Ms. Laube and her husband Sergeant Kerry Laube of the Westhampton Beach Police Department used a one-two punch, with Ms. Laube outlining the dangers while Sergeant Laube warned of the legal consequences. About 30 students high school students and many of their parents were on hand to hear the warnings that statistics show more than 40 percent of teens who start drinking before age 15 will develop alcohol abuse problems at sometime in their lives. “All kids are good, but even good kids make high risk choices,” Ms. Laube said. The deadliest period for teen drinkers is the period between the prom and graduation, she said. The problem is prevalent throughout Suffolk County, but particularly high among East End youths, Ms. Laube said. Suffolk County statistics show 80 percent of seniors drink alcohol, 61 percent of sophomores do so and 27 percent of eighth graders are drinking alcohol. Many Suffolk County boys begin drinking at age 11 while girls start by age 13, Ms. Laube said. Displaying a picture of a teen on a gurney following an automobile accident, she said nine out of 10 accidents are alcohol-related. What’s more, 95 percent of violent behavior on college campuses is related to alcohol abuse. “I’m not an anti-alcohol person,” Ms. Laube said. But her aim is to get youths to delay trying alcohol at least until their brains are fully developed at age 25. Ms. Laube implored parents to demonstrate they can have a good time with their peers without the need to always serve alcohol. Set clear rules for your children, she told the parents. And speak with other parents and unite in working to keep all students safe. Discuss prom night and plans not just for the dance itself, but for after-prom parties. Sergeant Laube took over, talking about his job enforcing not only laws pertaining to underage drinking, but also the social host law that can hold any adult 18 or over responsible if underage drinking takes place in their presence and they fail to stop it. For people in small communities who may not want to call local police because of the discomfort of being identified, New York State has set up a hotline at 1-866-UNDER21. Calls are anonymous, although local police will be dispatched to deal with the situation. “I really do care about each and every one of you very much,” Superintendent Michael Hynes told the students, imploring them to have an alcohol-free prom night on Saturday. Margaret Koller. Raffle winner Charlie Binder and his date will be going in style.